It’s hard to believe that it’s been 50 years since one of the most popular and influential bands of all time, The Beatles, released their first single “Love Me Do” and a phenomenon was born. Special events will be taking place all over the world to celebrate this momentous occasion and we want to be a part of it! At Best Friends For Frosting, we love a party, and we can’t think of a better way to join the celebration than by sharing an amazing collection of Beatles inspired desserts with our readers. Whether you are a Beatles maniac, a rock n’ roll fan, or a music lover in general, these desserts will have you singing “Ain’t she sweet” all day! 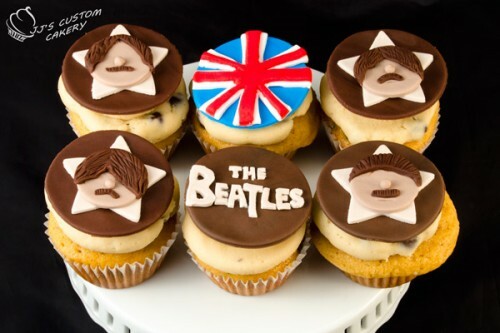 We found these fun Beatles cupcakes over at Cookies, Cupcakes and Cardio. They are chocolate chip cookie dough cupcakes with clever fondant toppers that highlight each of the four band members. Such a great tribute! This colorful Yellow Submarine Cake is a combination of vanilla-strawberry cake with strawberry filling, white buttercream, and marshmallow fondant. A truly amazing creation! Instructables shares these Beatles Band Cupcakes with us, and also shares the secret to stenciling silhouettes onto baked cupcakes with chocolate ganache. It’s easier than you think! A common theme is the Yellow Submarine Cake, and this bright, four tiered creation was actually made for a wedding. I wonder if it matched the dresses? 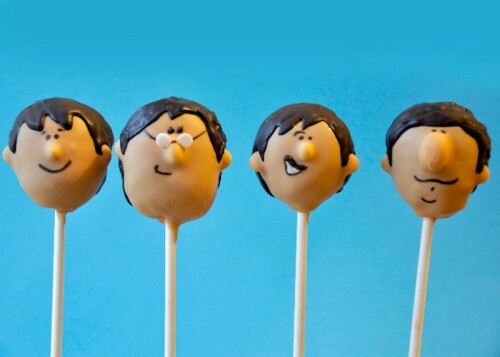 Bakerella featured these Beatles Cake Pops by “Pop Star” fan Melanie. Check out the amazing detail on each of their faces! 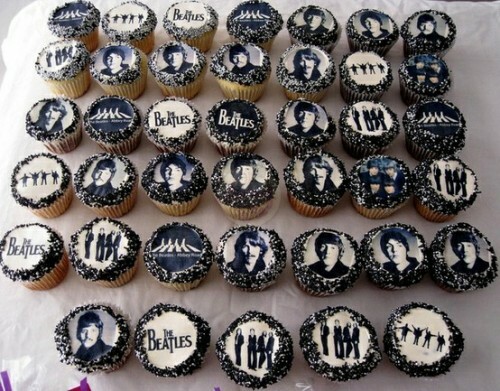 This collection of Black and White Cupcakes is a really fun throw back to the Beatles in their earlier days. I can’t begin to choose a favorite here!